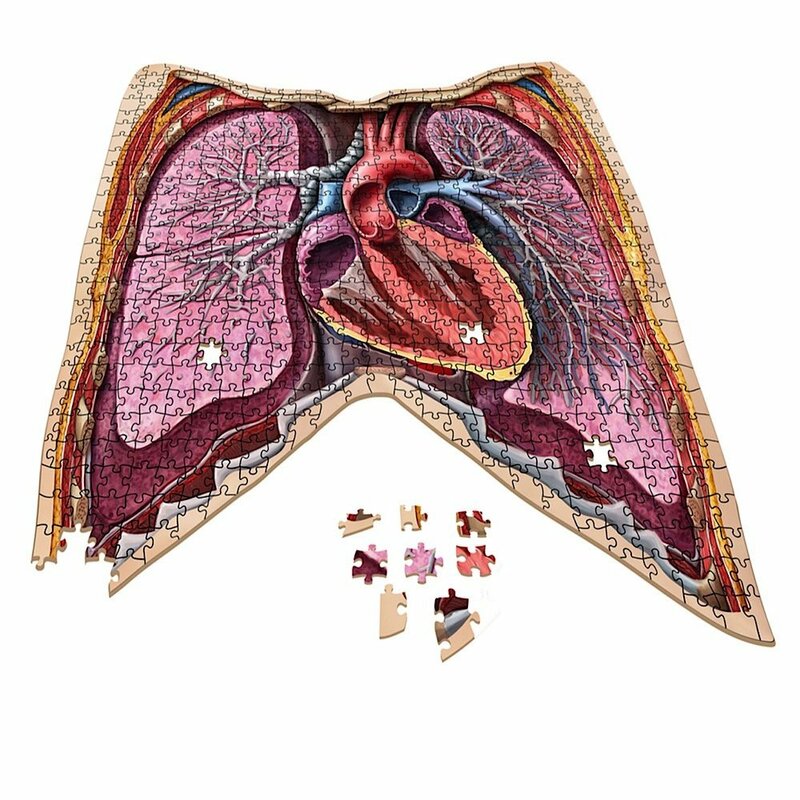 Human Anatomy Jigsaw Puzzles is a new series by Genius Games that give children an idea of what the human body looks like internally and how it functions. 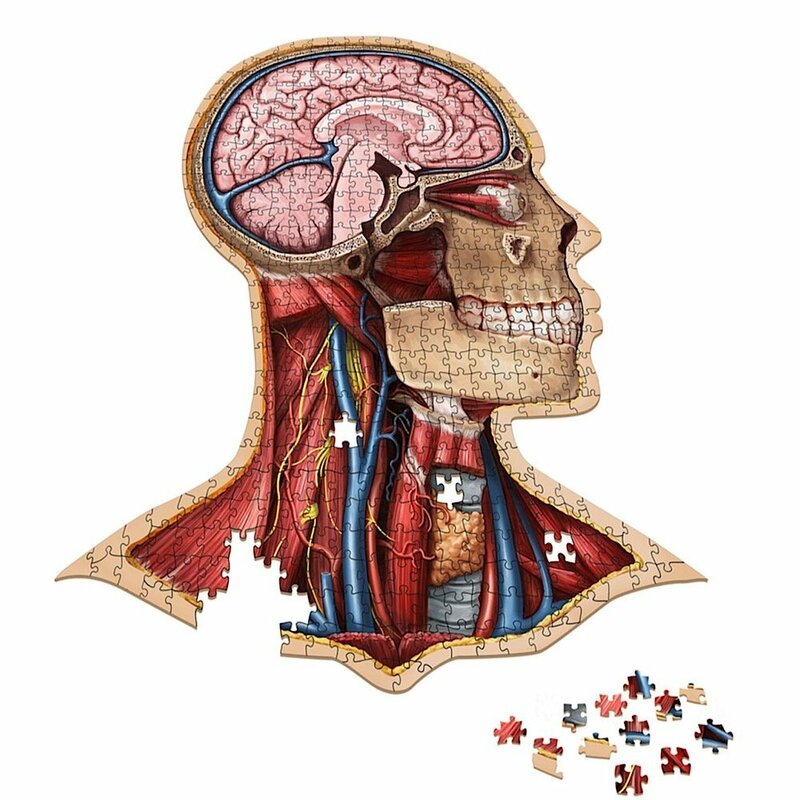 Human Anatomy Jigsaw Puzzles is a new series by Genius Games that give people an idea of what the human body looks like internally and how it functions. 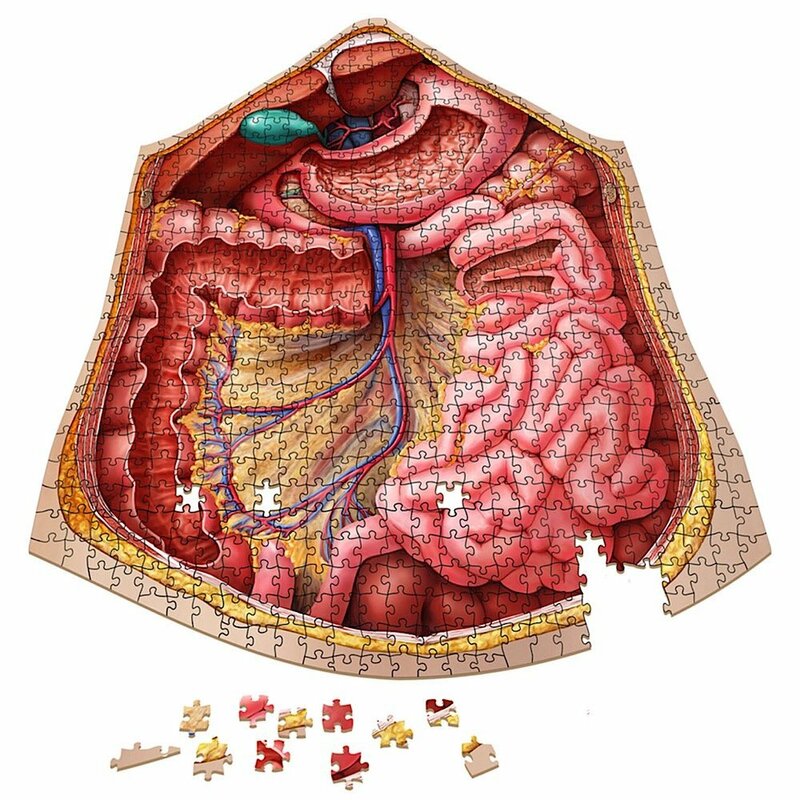 The puzzles help people recognize organs such as spleens. Essentially, if you put every piece together and you’ll form an anatomically accurate specimen of Homo Sapiens from head to thorax to abdomen. 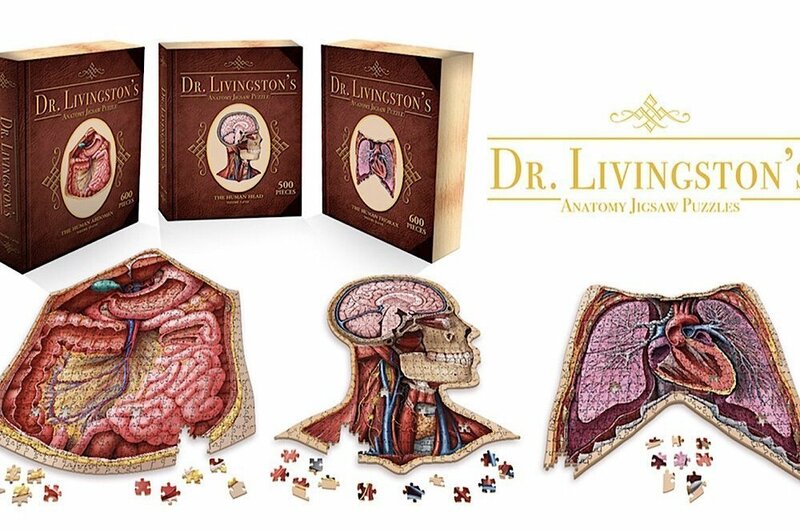 To celebrate National Puzzle Day on January 29, the makers of Genius Games are launching a Kickstarter for these “Human Anatomy Jigsaw Puzzles” to celebrate. If that sounds a little brainy, it’s supposed to! Humans learn by playing and what could more memorable than playing science games that are challenging and fun? Genius Games has already made The Periodic Table, Human Cells, and Particle Physics into strategic and family-friendly tabletop games. The company is looking to the living room floor, next, to gather science lovers to create giant jigsaw puzzles. Once completed, the larger-than-life Human Anatomy Head, Thorax and Abdomen and the full-size human (legs and arms are planned for later in the year) will be 10 feet tall. With the ups and downs of the toy industry, Kickstarter has become the go-to place to launch the next big thing in children’s educational products. Under John Coveyou’s leadership, Genius Games has launched 10 campaigns thus far, raising a total of over a million dollars in funding. John recently discussed this project and more via an exclusive interview. These puzzles show what the human body looks like on the inside. Meagan Meehan (MM): How did you get into illustrating and what about the human anatomy most fascinates you? John Coveyou (JC): The puzzles were actually illustrated by Mesa Schumacher, who is a Certified Medical Illustrator who studied at Johns Hopkins University. Personally, I find the interdependence of all of the systems inside us to be the most fascinating aspect of the human body. We all have these same systems inside of us, breaking down food, carrying oxygen to cells, and doing a million other things, and they’re all connected and rely on each other to keep functioning. And it works! That’s incredibly fascinating to me. MM: How did you initially come up with the idea for Human Anatomy Jigsaw Puzzles and how did you get interested in puzzles? JC: Since we currently publish science themed games, I spend a lot of time looking through illustrations of all kinds of science things, from human cells and microbes, to how things work, to illustration of human anatomy. Illustrations of what we look like under the skin have always been some of the most intriguing to me, and I remember thinking how cool it would be to have a huge painting of human anatomy to decorate my walls. Then I thought, it would be even cooler if you had to put it together first, like a puzzle. And when I realized that didn’t really exist yet, I decided to make some myself. MM: How did how different were the prototypes from the final products? JC: The first prototypes were just black and white shapes to show the size of the full puzzle and how many pieces we would need, etc. Then we printed the illustrations of the puzzles as well as the designs of the boxes to make sure everything looked right. Those were essentially handmade prototypes. The next step was to get white samples from the manufacturer. This are essentially just the box but without artwork so we can make sure the shape and size are right. The last sample was a production copy form the manufacturer that had the final artwork on it. That was the most exciting one to receive. We’ve also gotten some feedback from our backers on the box design and what they want most in puzzles like these, which has been very helpful. We will improve things with that feedback. The actual art on the puzzles has been constant – the human body hasn’t changed since we started! The puzzles help people recognize organs such as spleens. MM: How long did it take to develop the concepts and how many puzzles are in the line? JC: The concept took a couple months. Once the idea came, I started reaching out to Certified Medical Illustrators, because I knew we should get the illustrations 100% right if we were going to do this. Once I reached out to Mesa, we started the discussion on cost and pricing, etc. Then it took a good month or so to figure out exactly how we wanted to lay out the puzzles and which parts of the body each puzzle would cover. Once we knew that, it was time to knock out the contract so Mesa could start on the artwork. The Kickstarter that’s currently live is for three puzzles at 200% magnification: the head, thorax, and abdomen. We plan to make arms and legs to complete this larger-than-life human, for a total of seven puzzles. We have a few other ideas as well for further lines that we’re very excited about! MM: What prompted you to start a Kickstarter campaign? JC: We’ve had 10 Kickstarters so far for our games and books, all successful. We’ve managed to find a very excited tribe of people that geek out over accurate-science themed projects, and we knew they’d love this one as well. One of the nice things about Kickstarter is the feedback you receive from interested people, so you can tweak the product and make it even better. MM: How did you advertise the campaign? JC: A few different ways. First, we setup a Facebook Event for the launch. Then we reached out to our own fan base through our monthly newsletter and our social media channels, since we know they love fun science products. We also reached out to a bunch of media outlets seeing if they’d like to cover our campaign, and some of them did which was very exciting! We also partnered with a PR company (Kids Stuff PR). MM: What stores do you hope to sell these puzzles in? JC: These puzzles are going to be great for toy shops, hobby stores, gifts shops of science centers, hospitals, school stores, you name it! I would love to have copies sold through Barnes and Noble and possibly even Target, but maybe that’s wishful thinking. We’ve had a lot of biology teachers ask us for classroom packs so I think that’s a good market for us! These puzzles are so unlike any other puzzles out there and you might see a group of doctors putting them together in their off time, or a biology teacher putting it together with her students and hanging it on the wall, or even just geeky friends excited about the science! JC: My first visit to the New York Toy and Game Fair was incredibly memorable! The size of the place was breathtaking and I felt very small. Currently, we primarily publish science-themed board games so we are just now starting to get into the toy industry proper, and we think these puzzles are a great way to launch ourselves into the toy world! MM: Overall, what are your biggest goals for the future of Human Anatomy Jigsaw Puzzles? JC: The biggest goal is become a name that everyone recognizes and getting into mass market retailers! As far as the puzzles themselves, we’re planning on publishing more within this line of human anatomy puzzles to complete the full human and well as few other really exciting things we can’t yet announce. JC: If you’re into science, then we have a full line of tabletop games that you might love as well. You can find those at GeniusGames.org or on Amazon. We have a cell biology game called Cytosis that is endorsed by the Journal of Cell Science, and a card game called Ion that is endorsed by the National Science Teachers Association (NSTA). Check out their Kickstarter project to learn more. The puzzles are challenging enough to appeal to adults as well as kids.